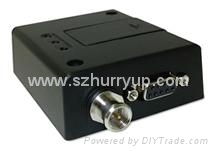 The UT864-E Terminal is an industrial high speed data modem with a data rate of up to 7.2 MBit/s. The UT864-E Terminal is provided with Windows and Linux drivers that signifcantly ease the integration in existing applications. The integration into the host systems can be done either via USB 2.0 or RS232. The UT864-E Terminal has been developped for the European market and is designed for M2M applications requiring very high data rates; at the same time it complies to industrial standards mandatory for most applications in the M2M segment. The UT864-E Terminal can be integrated for example into outdoor cameras for security applications. With an operating temperature range of -30 °C to +75 °C and the high data rates via UMTS/HSDPA/Edge the UT864-E Terminal can send high resolution video pictures almost in real time from all over Europe. Another application would be the usage for advertisments via LCD monitors. The UT864 Terminal has been prepared also for the UMTS markets outside Europe, such as the Americas and Asia (UT864-G variant).